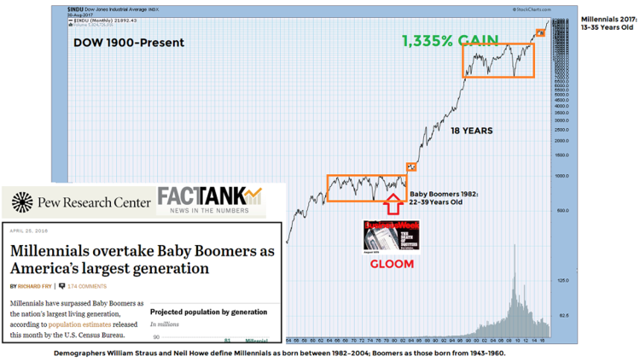 Stocks, Baby Boomers, and Millennials. Demographic trends could impact stocks and housing for years to come. How do the millennials compare to the baby boomers from a stock market perspective? This time, what’s driving the market is a shift in favor of owning rather than renting coming from the largest homebuying generation since the baby boomers: millennials. The baby boomers were 22-29 years old when a secular trend began in the stock market in 1982; the trend lasted 18 years. In 2017, the millennials were 13-35 years old. The demographics and chart patterns shown below tell us to keep an open mind about better than expected outcomes in the stock market over the next 5 to 20 years. These concepts were covered in detail in a September 1, 2017 video. Since publishing the video, stocks and housing have both appreciated. The fact that consistent, low-volatility markets are common a characteristic of early-stage secular bullish moves also aligns with the rise of the millennials. Disclosure: I am/we are long SPY, VOO, VTI. I wrote this article myself, and it expresses my own opinions. I am not receiving compensation for it. I have no business relationship with any company whose stock is mentioned in this article.